Karvy Franchise is one of best known stock broking franchise in the country. They are based out of Hyderabad. 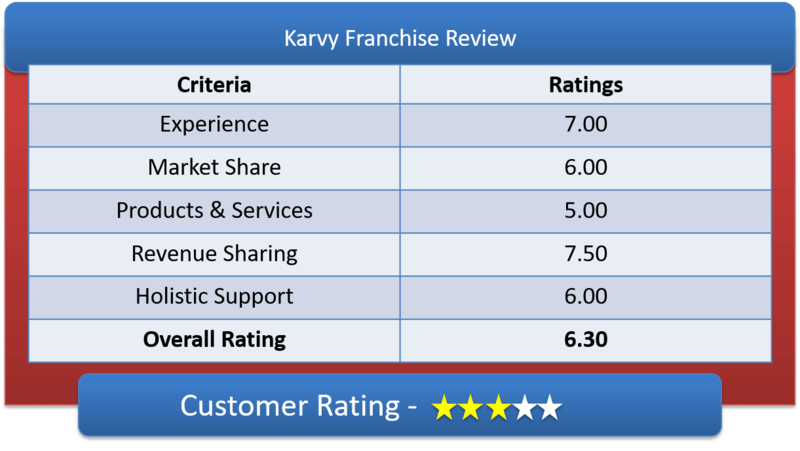 Lets have a detailed Karvy Franchise Review & deep understanding of Karvy Sub Broker Offerings, Karvy Franchise Revenue sharing models & other features of Karvy Partner Program. Karvy Online Franchise is now completely handled by Karvy Fortune. This group provides you partnership with Karvy and all other related supports. Currently, Karvy has around 60 million investors across India and providing their investors services across India among 400 plus corporate houses. Karvy has presence in 330 cities, and a total of 787 associates in India, and over nine thousand highly qualified Team of Karvy. Karvy Fortune is always on feet for helping hard working, ambitious partners for mutual profitable business. The process to become partner start an enterprise with Karvy is hassle-free. The risk of loss with Karvy after becoming a franchisee is also very low. And a strong brand name in the financial markets in India that has great value is important for client acquisition. Remisier – You need to deposit Rs. 25,000 to become a Remisier and revenue sharing is 40% to you and 60% to Karvy. Master Franchise – In this, if you introduce any person franchisee you get 5-10% of that Franchisees brokerage amount. You will have to deposit Rs. 50,000 (deposit refundable during exit). You need to get signed an Agendum with Karvy and Introducer. Their franchise is known as Karvy Fortune. Karvy Fortune, helps individuals and small organizations forge a partnership with Karvy. Lets have a detaled discussion of Karvy Franchise Revenue Sharing, Karvy Sub Broker Initial Deposit & other fees. When it comes to brokerage revenue sharing then you need to be honing your bargaining skills with the house. For Commodity, deposit required is Rs 25000 – Rs 50000; revenue sharing is 70:30; registration charge is RS 2390 (non-refundable), CTCL is 250 per month. For Currency, NSE registration fees is Rs 2500 and CTCL is 250 per month; revenue sharing is 70:30. Equity e-Franchise Model: Deposit required is Rs 25000 and they charge Rs 7500 for registration (BSE, NSE and F&O). Here, CTCL is not applicable. The revenus sharing is 40% to you and 60% to Karvy. And no Offline trading facility. Brick and Motor Model: In this, deposit required is Rs 50000; revenue sharing is 70:30 and they charge Rs 7500 for registration (BSE, NSE and F&O), also back-office charges extra. For Self-Setup type, Rs. 25,000 – Rs. 50,000 is needed to be deposited as security amount. This amount is refundable when you exit Karvy Franchise. Based on your client base you will get access to all the segment to trade into with Karvy. You will have to bear the expenses of running the office and internet as well. Apart from refundable amount mentioned above you also need to pay Rs.2360/- (non-refundable) for each segment that you want to trade into and CTCL of Rs. 250 per month. Karvy Fortune offers wide range of financial product to satisfy your client in any segment they want to trade into. The broking house is registered under SEBI. They offer Loan on collaterals, commodities, currency trading, PMS, DP, merchant banker, corporate agency, MF and its distribution, IPO and its distribution, corporate advisory services, etc. The provide robust training about the business pitches and software like Omensys NEST and also all back-office support. Helps you with well-trained dealers for fast execution of order and Online cash management. Once you are registered with Karvy, they will offer you training on their trading platform which will be free of cost. How to become Sub Broker of Karvy? Also, you should have a minimum two years of experience of stock market and trading. Once you are ready with these papers then you are asked to sign agreement approved by a registered chartered accountant and then you get a Franchise code. This is the final step after which you get the business going with Karvy Online.